Since 7 years of age the teachings of THOTH have been brought to me. The call to 'tune up the world' at this young, exploratory, and confident age has led to the pursuit of the arts, to pioneering program development that has and continues to serve special learners, to the advancement of non-toxic land management legislation, to the designation of poet laureate, to the development of an integrated stress management and response system of sound therapy. Each discipline is an expression of the APOGEE Paradigm™. Newly ordained as, 'Messenger,' I am bringing the teachings of THOTH and The Kybalion forward. APOGEE Acu-Tone™ reflects, practices, and applies these laws and principles, as guides to awareness, discernment, balance, health and well being. Hermes also known as THOTH, lived in Atlantis and Egypt for over two thousand years, according to the channelings of Djwhal Khul and Vywamus. He was known at the time he lived throughout the world, as the Master of the Masters. 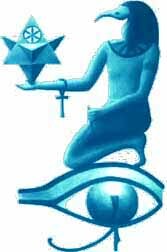 Egypt was one of the highest spiritual civilizations that has ever existed on planet Earth, and Hermes played a key role in its flourishing. Hermes was known as Hermes Trimegistus. He was the father of occult wisdom and one of the founders on Earth of astrology and alchemy. 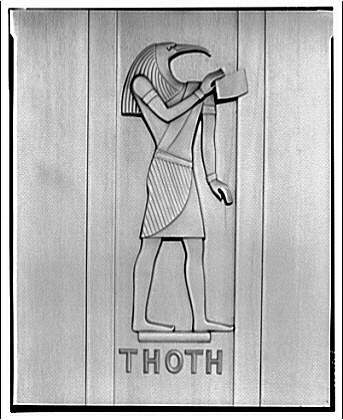 The Egyptians were so amazed by the profundity of this man and his teachings they deified him under the name THOTH, and He became one of their Gods. In later times, the civilization of Greece made Him one of their Gods also, calling him, Hermes, the God of Wisdom. He was considered the messenger of the Gods. The term Trimegistus means thrice great, or great/great, or greatest/great. 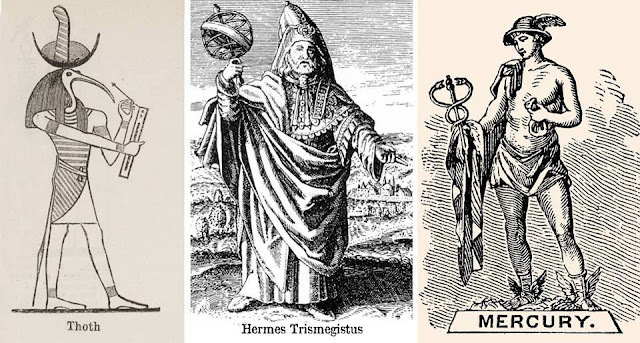 Hermes name became synonymous with the “Fount of Wisdom”. In His later incarnation as the Buddha, he would be known in a similar way, for Buddha embodied wisdom, and Christ embodied love and wisdom. The Lord Maitreya, in our present day, embodies wisdom, love, and power. Hermes was also called the scribe of the Gods. The Hermetic teachings are found in all lands and all religions, because of the universality of its appeal. In early days there was a compilation of certain basic hermetic maxims, axioms, and precepts, which were passed from teacher to student, which is called the “Kybalion”. Later in the civilization of Rome he was again Deified and His name was Mercury, usually imaged with a winged cap and sandals. The other book besides the “Kybalion”, which is the most important of the Hermetic writing, is called the “Divine Pymander”. This sets forth a complete system of metaphysical theology and philosophy. Before sharing with you the seven great Hermetic principles of Hermes, I would like to share a couple of quotes from His writings to give you a flavor and feel for this great Avatar. in the embrace of the NOW joy ever in presence... Accord in observance. These seven Hermetic principles are the basis for the entire field of Hermetic philosophy. I will present each one of these seven Hermetic principles and give a more in-depth explanation of their meaning. This principle embodies the understanding that everything in the universe is created by thought or mind. There is nothing that exists in the material universe where this is not the case. The great Edgar Cayce, in his Universal Mind channelings, would over and over again say “thoughts are things”. The entire universe was created by the thought of God. We, as God’s sons and daughters, create our reality both metaphysically and physically by the power of our minds. The great law of spiritual psychology is that it is our thought that create our reality. Everything that exists is spirit. Matter is just densified spirit. Spirit is just refined matter. All is just energy. This famous aphorism was created by Hermes. I have mentioned it many times in my books because it has such wide application. What this law means is that the thoughts and images that we hold in our conscious and subconscious mind will manifest its mirror likeness in our external circumstance. The outer world is a mirror of our inner world. If we hold thoughts of poverty we will have no money. If we hold thoughts and images of lack of good health, this will manifest within our physical bodies. The thoughts and images we hold in our mind will attract their physical likeness to us in our external circumstance. This law works unceasingly for the good or the bad. By understanding this law we can use it for our benefit instead of our detriment. The most profound application of this law is seen in the life of Sathya Sai Baba. Whatever he thinks instantly manifests, even on a material level. He creates physical objects with the wave of his hand, and he says he does this by just thinking and imaging upon what he wants to create. This is the same law just speeded up. Earth is a school for practicing these laws of mind and spiritual control. Imagine what would happen if the average person on the street were manifesting his thoughts instantly as Sai Baba does. If he had a negative thought about someone at this level of vibration it might actually physically kill this person. Imagine what all the negative thoughts and emotions would instantly do to one’s health. For most of us it is a good thing that things don’t manifest that quickly yet, or we would be in a lot of trouble. The higher we go in vibration and initiation, the quicker your manifestation of your thoughts will occur. That is why the spiritual path at these higher levels has been called the straight and narrow path, and is visualized like a pyramid that gets narrower as you move towards the apex. This principle explains the difference between the different manifestations of matter and spirit. From pure spirit all the way down to the grossest level of matter is a continuum of varying degrees of vibration. Every atom and molecule is vibrating in a certain motion, speed, vibration, and frequency. It is the combination of these frequencies that determine the form of any given object, be it of a physical or metaphysical nature. Everything is in motion, and is vibrating and nothing is at rest. Even a physical object, as for example a chair, is really in a state of motions. The atom, and electrons are vibrating and there is space between these atoms and molecules. This is true of the atom as it is true of the solar system, galaxy, universe, and super universes. For the omniuniverse is nothing more than a large atom. The microcosm is like a macrocosm. Sai Baba can take a physical object and transform it into a new object in a physical sense by just changing this motion. We do the same thing, for example, with our bodies by how we think. The entire universe is in a state of motion evolving about the great central sun. Every atom is a mini-universe within every molecule of our physical bodies. How we think will manifest our feelings, emotions, action, health, and what we attract to ourselves because energy follows thought. The ideal is to create a motion that is determined by your Higher Self, rather than by the lower self, or negative ego. Each of the seven initiations is a higher level of vibration and motion. God is the highest pinnacle of vibrational frequency for which we are striving. This is a fascinating principle and law, as stated above. Take, for example, heat and cold. Though they are opposites they are really the same thing. It is merely a matter of degrees of the same things. The same could be said of spirit and matter. They are really the same thing. They could be likened to water. Freeze water and it becomes ice (matter). Boil water and it evaporates and becomes gaseous fumes (spirit). They are identical in nature, but different in degrees. If you look at a thermometer where does heat terminate and cold begin? In actuality it is totally relative to one’s body type and individual preference. This same principle applies to all pairs of opposites, light and dark, large and small, hard and soft, positive and negative. The same principle also applies on the mental plane of reality. Take, for example, love and hate. They are the same thing but different degrees. The importance of this law comes in the understanding of one’s ability to transmute and change the vibrations from one extreme to another. This, in reality, is the study of alchemy. The alchemists of the middle ages were preoccupied in changing base metals into gold. This is possible as Sai Baba demonstrates so clearly and instantly. However the real meaning of this comes in the understanding of changing one’s base thoughts and emotions into spiritual gold or soul realized energies. The science of attitudinal healing is working with this art of polarization. This is why psychics were predicting a shifting of the physical poles of Earth, because the poles of humanity’s consciousness were not shifting from fear to love. Hate can be transformed by the power of your mind into love (gold). Your lower self can be transformed into your higher self. Your physical body can be transformed into your light body (ascension). Separation can be turned into oneness. Guidance by your negative ego can be turned into guidance by your soul, using the art of polarization. An empty bank account can be transformed in a full bank account. We just need to polarize our consciousness differently. A person who is run by the emotional body needs to become polarized in their mental body. A person who is identified with their mental body or intellectual self may need to become polarized to the soul. A person merged with soul will need to become polarized to the monad. A person merged in the monad will need to become polarized to God. All varying degrees of the same thing. This law stated above, we see manifesting in every aspect of our lives. We see it in the tides of the oceans. We see it in our need for sleep after a day of work. We see it in the creation of a star and sun and its eventual collapse. We see this law operating in the rise and fall of nations, and even in the operation of omniuniverse. For every action there is an opposite and equal reaction. We see this in our breathing, and we see it in the way God breathes. God breathes out creation and then He breathes in creation. We see this in the movement of stars and in the science of astrology. As the earth moves through the different signs of the zodiac. We also see this law operating in the mental states of man, where the Hermetic practitioner finds its greatest and most useful application. The Hermetists apply the mental law of neutralization. The Hermetist cannot annul or cause this principle to cease operation, however, they have learned to escape its effects upon themselves to a certain degree. The degree to which this is obtained depends upon one’s application of this law and upon one’s level of initiation at later stages. Hermetists have learned how to use this law instead of being used by it. The Hermetist’s understanding the previous law of polarity, polarizes himself at the point at which he desires to rest, and then neutralizes the rhythmic swing of the pendulum which would tend to carry him to the other pole. I am speaking of this now on the mental and emotional level. The Master does this by the use of will and detachment to create a state of consciousness that is not swung backwards or forward like a pendulum. The masses of humanity live on a mental and emotional roller coaster. The ideal is to attain a state of consciousness of divine indifference, evenmindedness, equanimity, inner peace, joy, unceasing happiness and bliss. This is best explained by Krishna in the Bhagavad Gita, which is the same teaching of the Hermetists. The idea is to stay even minded, whether you have profit or loss, pleasure or pain, sickness or health, victory or defeat, rejection or praise. This is just a matter of where you polarize your mind and state of consciousness. There is a point of neutrality or objectivity, or divine detachment, that is not caught up in the pendulum swing between these rhythms and polarities. There is a state of consciousness called God consciousness where you don’t have to have a bad day. At the highest application of the use of this principle of neutrality, it is even applied into the physical body as well, for example, Sai Baba never sleeps. He doesn’t need food. He never gets tired. He can bilocate and be at two places at the same time. This is the Ascended state of consciousness, when the monad or spirit merges completely with the physical vehicle as well, and the physical body is turned into Light. The duality becomes transcended. Whether you are on an emotional roller coaster or evenminded and have unceasing equanimity and joy is determined by your attitude and the polarization of your mind. This is why the understanding of these principles are so important. Hermes later life as Buddha expounded on this further when He said, all suffering comes from one’s attachments, and wrong points of view. Exact same teaching. Part of the purpose for writing this book is to show how these principles are the same in all religions, whether you study the Egyptian teachings, or Buddhism, Christianity, Hinduism, Taoism, the Koran, or others. The same principles all express in slightly different forms. The other interesting thing, of course, is to see how it is often the same person who started two or three different religious movements. There are no accidents in the universe. Everything in the universe is governed by laws. There are physical laws, emotional laws, mental laws, and spiritual laws. By understanding these laws we can learn to operate in grace instead of karma. Many times we don’t know the cause for the reason things happen to us. This is because there are seven dimensions of reality in which causations can occur. As Edgar Cayce said, over and over again in his Universal Mind readings, “Every jot and tittle of the law is fulfilled.” No one escapes anything, even though it may appear like some people are, in truth, they are not. The average person on the street is an effect, not a cause. They are an effect and victim of thoughts, moods, emotions, desire, appetites, lower self, other people, biorhythms, the physical body, past lives, subconscious programming, heredity, the weather, astrological influences, vital forces, disincarnate spirits, glamour, maya, illusion, and the environment, to name a few. The Master rises above and has a great deal of mastery over these things the higher one evolves. By the time of the sixth initiation and ascension, all of them are transcended. The Masters obey the causation of the higher planes, but they help to rule them on their own plane. At each level of initiation one goes up another plane of consciousness, and hence, can even become a greater cause. The key for most people of the earth plane is to gain mastery over your mind, which will lead to mastery over your emotions and desires, and also mastery over your physical body and appetites. Djwhal Khul has called this mastery over your three lower vehicles (physical, astral, mental bodies). Your thinking must be subservient to your soul and monad (spirit), instead of your lower self and negative ego. When these lessons are mastered then there really is no reason to attend this school called Earth life, except for service to our brothers and sisters who have not learned these lessons. Everything has a yin and yang. On the physical plane each person has a male or female physical body, however psychologically each person is androgenous with male and female qualities. Each person has a left brain and right brain. In Chinese philosophy, the physical foods a person eats are divided into yin foods and yang foods. This law not only applies on the physical plane, but also on the emotional, mental and spiritual planes. Father God and Mother Earth, Yin types of emotions and yang types of emotions. Yin types of thoughts and more yang type of thoughts. I have listed the yin and yang qualities at the close of this section for your study and contemplation. The key point here is that the spiritual path is the path of balance and integration. Buddha called this the middle way. He demonstrated that the path to God was not the path of self indulgence or asceticism. It is the path of balancing the male and female aspects within self and also balancing the heavenly and earthly aspects within self. The spiritual path is also the balancing of the three minds, the four bodies, and the seven chakras. It is also the proper balance between the soul and the ego. This is done by transcending negative ego, and hence, keeping the ego in its proper balance and relationship to soul, which is to let it take care of the physical body, but not interpret your life. As mastery is gained a welcomed state of balance is experienced. One moves closer and closer to “knowing thyself”, and the universal laws that govern our BEING. ancient and secret of the great works of ancient wisdom. TRUTH and FORBEARANCE the NOW in WISDOM shown. enjoyed by hundreds across the age span.